So, now’s as good a time as any to acknowledge: this is a hokey show. I’m going to try and avoid 24 comparisons as much as I can, because that’s not fair to either series, but they do share one thing—dialogue-wise, both shows are as flat, straightforward, and square as they come. 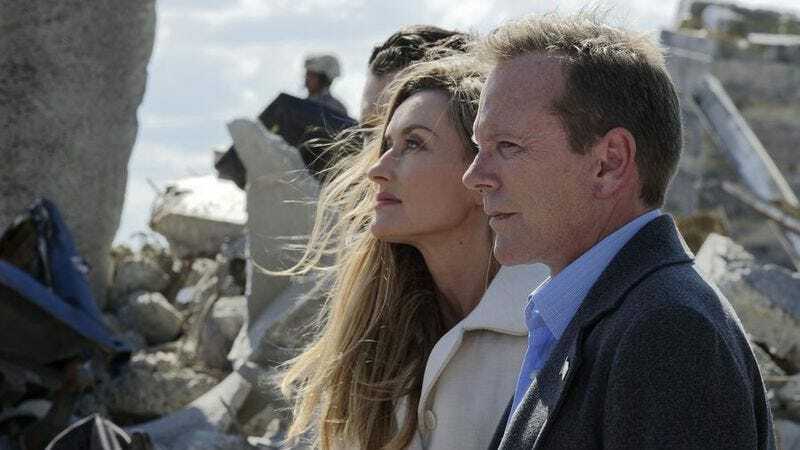 It’s not so much that Designated Survivor lacks jokes; given the circumstances, a constant flood of wisecracks would be out of place. But there’s a hokiness to the conversations that can’t be entirely ignored, a lack of poetry and grace that turns every line into a simple declarative sentence, functional but nothing more. Which isn’t that unusual, admittedly, but it does take some getting used to; and I’d be lying if there were moments in both the pilot and “The First Day” when I couldn’t help cringing a little. Two episodes in, and we don’t really know much about these people beyond the surface. Kirkman is a determined idealist, his wife is worried but supportive, his teenage son is a standard TV Teenage Son. The people supporting Kirkman and the ones looking to tear him down are pretty much exactly what you’d expect, with actors doing their best to make the most out of the few notes they’re given to play. This simplicity also filters into the storytelling. The episode plotline for “The First Day” involves the governor of Michigan using the attack on the capital as an excuse to have his cops round up every muslim they can find. When Kirkman tries to talk him down, Governor Royce (Michael Gaston) tells him, in essence, to go screw; he ignores the power of the new president, pointing out that there really isn’t much of a government anymore, and he can do what he believes is necessary to protect his citizens. All of which seems to be raising some dangerous, and potentially gripping, new ramifications of the attack. Putting aside the racial profiling, Royce’s complete lack of interest in Kirkman’s authority is a reminder of just how chaotic things have become, and could, in theory, lead to any number of states opposing the new president’s will for their own petty reasons. The explosion didn’t just give us a premise; it’s a device whose ramifications could, and should, last for a very long time, expanding outward in directions that the audience can’t predict. Midway through the hour, Kirkman visits the bomb site and tries to give a speech, but his audience is distracted by video on their phones of a 17 year old boy being beaten (ultimately to death) by Michigan police. The sequence has great nervy energy to it, and seeing Kirkman failing once more to inspire the populace, along with Royce’s initial, abrupt dismissal, feels like the sort of bold move that would give the show power to undercut the corniness. Unfortunately, Kirkman is able to talk Royce down with a lie about Homeland undercover agents; it’s not a bad solution, exactly, as it shows that Kirkman is clever and willing to stretch things if he believes it needs to be done, but if this the last we see of Royce, and of the threat of states bucking federal authority, it’ll be a shame. A neat resolution like this threatens to rob the show of the energy it needs to make its hook work, and while I’m optimistic that future episodes won’t abandon this concept, a scene in the final montage suggests that this optimism may be misplaced: after being harassed by cops early in the episode because of his skin color, Seth Wright visits a vigil on his way home, only to meet one of the cops who profiled him earlier. They bond. It’s the sort of palliative, “see, we’re really all human beings underneath” conclusion that, while pleasant enough, means that any discomfort the earlier scene might have caused it now supposed to be washed away. This is the sort of storytelling television has been accused of for decades now, though, and I’d be lying if I said that it doesn’t offer some satisfaction. Even that dialogue has a certain, homey ring to it. And while “The First Day” is too quick to offer easy solutions to some problems, it’s still well-paced and enjoyable pulp. The closest it comes to completely derailing is the threat of a storyline with the children (never a good thing), but it’s only a couple of scenes, and it ends on more or less the right note—Alice telling Leo to grow-up, him saying he’ll try, and while it’s not revelatory, it at least has the advantage of avoiding the usual endless back-and-forths that seem to plague this kind of drama. But then, it’s not entirely clear what kind of drama this is. Emily and Aaron arguing over cabinet posts suggests a potentially fascinating through-line, since, as we’re reminded again this week, Kirkman and his staff are going to need to rebuild a large part of the government. But it’s questionable whether or not we’re going to deep dive into that, given all the juicy stuff about explosions and the made up terrorist groups who may or may not be responsible for them. Ideally, I could see Designated Survivor pulling off an entertaining mix of political squabbling and occasional espionage without delving too deeply into either. The trick is giving us just enough jagged edges to make both sides more than rote expressions of cliche. Also, we could use some good villains. This week gives us Royce, who isn’t much, the return of Cochrane, who is maybe less, and someone who we aren’t quite sure about yet: Kimber Hookstraten (Virginia Madsen), the Republican Designated Survivor, who seems all smiles and helpfulness, but ends the episode doing an Internet search on Kirkman’s past. Which isn’t exactly high up on the list of threatening gestures, but it at least gives us someone who we aren’t entirely sure of. The more we get of that, the better. Sutherland sticks largely to his “soft-spoken good guy” routine, but he does let a little of the old Jack Bauer magic out when he shouts down Cochrane in the situation room.